One thing that I have working already that I'm really happy with is the fact that you (the player) are not treated special by the zombie AI. They will gladly ignore you if there is another human that is closer to them. There is something really cool about walking down a street and seeing people being herded by zombies. There is collision detection that makes you bump into other people and prevents you from walking on water but there isn't any yet for the building walls. 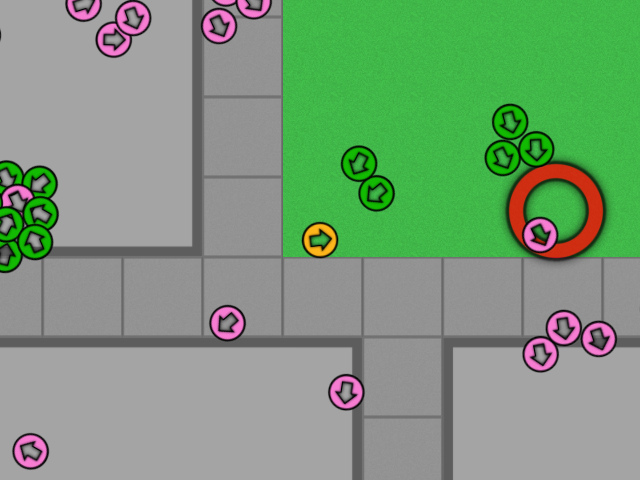 You are the orange circle, human survivors are pink and zombies are green. I know that not everybody likes them but the arrow circles will always be the default appearance for people in the game. But I will quickly put together some kind of a re skinned version if there are any color blind or partially color blind players that are finding it difficult to differentiate between them and there might eventually be built in support for alternate skins. I'll be alternating between working on this and The Unmapped Forest.